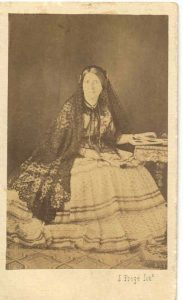 Elizabeth Vignoles née Hodge holds unique status as the first woman to join the Photographic Society (now the Royal Photographic Society) on 31st January 1853. Daughter of gentleman farmer John Hodge, Elizabeth was the second wife of eminent civil engineer Charles Blacker Vignoles (1793-1875), a founder member of the society and keen advocate of photography. The Photographic Society demonstrated a ground breaking approach in its gesture of equality to male and female photographers, and in its first year attracted the membership of seven pioneering women. Elizabeth attended the first meeting of the newly formed Photographic Society on 3rd February 1853  but did not take part in the Photographic Society exhibitions. She supported her husband in hosting early meetings of the Council of the Photographic Society at their home at 21 Duke Street, Westminster. Elizabeth Hodge was born in Brampton, Devon in about 1813, but her exact date of birth or baptism is unknown. Little is known of her early life, but on 16th June 1849 she married Charles Blacker Vignoles at St Martin in the Fields London, by licence granted 14th June 1849. She became step mother to the five grown-up children of Charles’s marriage to Mary Griffiths (d.1834) but Elizabeth and Charles did not have any children. At the time of their marriage, Charles was working abroad for most of the time. In April 1850 the couple moved to Arman Lodge, a cottage in Lower Tulse Hill. After Jan 1851, when Elizabeth joined Charles on the first of many journeys during the early years of their marriage, it appears that they stayed in temporary accomodation near his Chambers in Westminster, moving to a permanent establishment at 21 Duke Street in 1853. In 1846, the Tsar Nicholas I of Russia commissioned Charles Blacker Vignoles to build a suspension bridge over the River Dnieper at Kiev. Elizabeth accompanied Charles to Kiev in 1851, 1852 and 1853, staying for some months each time. In 1851 she would have met John Cooke Bourne who was experimenting with Calotype photography as well as sketching and painting. In 1852 she was party to Roger Fenton’s photographic journey via Moscow before his formation of the Photographic Society the following year. In 1853 John Cooke Bourne took a sequence of images just prior to the opening of the bridge, an event which was also attended by Elizabeth. Charles Blacker Vignoles spearheaded the use of photography to chart the progress of the Kiev Bridge construction, inspiring other engineers to use photography as a civil engineering aid. John Cooke Bourne’s photographs were subsequently requested by HRH Prince Albert in 1855. Charles was appointed Chief Engineer for the Bilbao to Tudela railway company, and in May 1858 Elizabeth set up house with him in Spain, where he was resident to supervise the design and construction. On this occasion they were joined by two grandchildren following the death of their mother in Bahia, Brazil. Elizabeth then took over their care whilst in Bilbao and subsequently on their return to London in 1864. The 1871 census documents Elizabeth as living in Duke St, London with husband Charles Blacker Vignoles and his two grandchildren, Charles Auguste aged 16, and Isabel aged 18. Elizabeth died at Villa Amalthea, Hythe, Southampton on 13th March 1880 outliving her husband by five years. She was reunited with Charles, buried in his grave at Brompton cemetery where it is declared that she was 67 years old. My grateful thanks to John Vignoles for access to private family documents and his invaluable assistance in researching the life of Elizabeth Vignoles. Confirmed female names on membership list for 1853 – Elizabeth Vignoles was joined by Amelia Elizabeth Guppy (1808-1886), Mary Anne Boulton (1829-1912), Catherine Verschoyle (1802-1882), Lady Caroline Kerrison (? – 1895), Lady Payne-Gallwey and Miss Jesse Fergus (1794-1863). Olinthus Vignoles. Life of Charles Blacker Vignoles FRS, FRAS, MRIA, &c. Soldier and Civil Engineer. (London: Longmans Green & Co. 1869) p.301 Footnote.